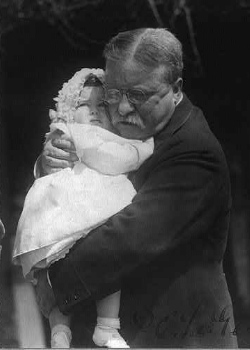 Theodore Roosevelt left behind a legacy unrivaled by most presidents. One of his lasting marks was the changes he initiated on U.S. coinage, including the $2.50 Indian Head Quarter Eagle in 1908. An unusual aspect of the Indian Head Quarter Eagle is that its design elements are sunk, or incused, into the coin, as opposed to being raised above the surface as seen on most other coins. The idea of an incused design was proposed to President Roosevelt by a close friend, William Sturgis Bigelow. The president approved, assigning Bigelow the responsibility of procuring a model for both the quarter eagle and half eagle. Bigelow in turn enlisted the aid of Boston sculptor Bela Lyon Pratt to prepare the models. Pratt submitted his finished work to the Mint on June 29, 1908. Pratt’s obverse depicts an Indian wearing a war bonnet. The reverse shows a calm eagle perched upon a fasces bundle wrapped in an olive branch, symbolizing military readiness and peace, respectively. Is it true that you are going to meet the criticisms on taking – “In God we Trust”—off the coins by putting “I know that my Redeemer liveth” on the Treasury notes?. Before Roosevelt could act, Congress eliminated the motto controversy by passing a bill on May 18, 1908, requiring the motto be present on all gold and silver coinage. A law created in 1955 made the appearance of "IN GOD WE TRUST" mandatory of all U.S. coinage, a law which is still in effect today. It was the hope of every one that when our new coinage appeared we would have one of great beauty and artistic merit. But the new $5 and $2.50 gold pieces just issued totally lack these qualities, and not only those of beauty, but actually miss the practicability to which every effect of beauty in relief has been sacrificed…. The head of the Indian is without artistic merit, and portrays an Indian who is emaciated, totally unlike the big, strong Indian chiefs as seen in real life….. The sunken design, especially the sunken portion of the neck of the Indian, will be a great receptacle for dirt and conveyor of disease, and the coin will be the most unhygienic ever issue…. These coins will be a disgrace to our country as a monument of our present ideas of art as applied to coinage. On top of that, a common complaint was that the Indian Head Quarter Eagle did not stack well, nor did a stack equal the stack height of the same number of its long-lived predecessor, the Coronet Quarter Eagle, causing trouble for bank tellers trying to do quick counts. Chapman did not give up easily. His next move was to take his case directly to the president. Roosevelt's support of the new gold coinage did not waver, and even if it had, the Pratt design was protected by the law requiring coin types to remain in service for at least 25 years before being replaced. Theodore Roosevelt took a great interest in United States coinage and played a leading role in reshaping its appearance. Since the inception of the US Mint in 1792, tradition dictated that no real person ever be depicted on a coin. With Roosevelt's encouragement, this changed in 1909 with the adoption of the Lincoln Cent. In addition, he directed a complete overhaul of the nation's gold coinage, bringing worldwide acclaim to United States hard currency as artistic marvels. Above, T.R. is pictured with his granddaughter, in one of the last photos ever taken of the 26th U.S. president. Indian Head Quarter Eagles were made every year from 1908 through 1915, at which time, production was put on hold. In 1925, the quarter eagle resumed, but ended abruptly in 1929 following the stock market crash. There may have been a plan to someday mint quarter eagles once more, but as the Great Depression lingered on, the federal government in 1933 discontinued and demonetized gold coinage. Never again was there to be United States gold coinage minted for general circulation. 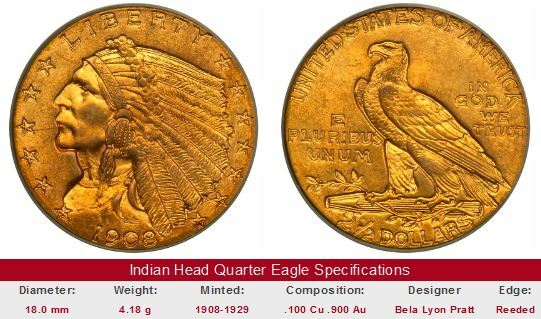 There is only one key date in the Indian Head Quarter Eagle series, and it is the 1911-D. Its mintage of 55,680 is by far smallest in the entire group. It is a smart idea to insist that any 1911-D Indian Head Quarter Eagle under consideration for purchase be certified by one of the four leading grading service companies: PCGS, NGC, ICG, or ANACS. Because the 1911-D is THE key date coin in the series, it has received a lot of attention from hucksters who use sub par specimens or outright fakes to swindle eager but inexperienced collectors. Then again, if you're dealing with a seller of unquestioned reputation, it is not quite so important that the coin be certified by one of the "Big Four". The box below triggers a search of eBay coin auctions to find all 1911-D Indian Head Quarter Eagles currently for sale. The left hand side of the "Sales Box" depicts value trends over a very long period of time for the 1911-D in XF-40 condition. The percent annual increase since 1950 is computed for so you will know how well it does compared to other coins. There are usually several 1911-D examples available at any given moment in time on eBay. Be patient and follow the advice in the paragraph directly above. If you land a properly graded, trouble-free coin, you will be the owner of a key date U.S. gold coin that will always be in high demand from a solid collector base. The coin pictured for sale in the right hand side, if any, is not necessarily the same condition coin as that represented in the value trend analysis on left hand side.